We will endeavour to publish positive reviews (3 stars and above) within 24 hours of receipt. If you receive a review of 1 or 2 stars, we will inform you within 24 hours of receipt requesting that you contact the customer within 7 working days in order to determine whether you can work together to improve their rating. Most disputes are resolved at this stage. If this is not possible, MGF will request evidence from all relevant parties with a view to reasonably assessing the dispute. MGF will conclude if we feel the poor review is justified. If MGF does not believe that a poor review is justified, we will inform all relevant parties and delete the review. If MGF believes (acting in its sole discretion) that you have provided a poor service, we will request that you rectify this directly with the customer concerned. Most complaints or poor reviews are resolved by the end of this stage. We understand that things can go wrong between business and customer for lots of different reasons. The MGF Recommended Directory relies on transparency and our members trust the honesty of the reviews. This is why we will always publish negative reviews – once we have completed the above process – if the customer choses to go ahead. If a business receives an extremely negative review which we investigate and reasonably believe to be true reflection of events, or if there is a series of complaints about one business, they will be removed from our directory and will not be reinstated. We operate a strict ‘three strikes and you’re out’ policy. No refund will be offered in any circumstance. The above review policy also applies to negative commentary published by customers on any of our three Facebook pages – Mummy’s Gin Fund, Mother’s Little Helper and/or MGF Buy and Sell. You accept and acknowledge that MGF cannot police all negative commentary posted on Facebook pages and therefore we request that you inform us of any negative feedback within 7 days of it being posted. We reserve the right to remove any business that we do not feel represents the spirit of Mummy’s Gin Fund because of their poor customer service or poor quality of their work. Although reasonable effort is made by Mummy’s Gin Fund (MGF) to ensure suppliers and/or businesses listed on the Mummy’s Gin Fund website and/or social media including, but not limited to Twitter, Instagram and Facebook, are legitimate and reputable, MGF cannot be held responsible for any work performed, goods supplied and/or services received nor do we control or can be held responsible for prices of such services, products and goods, availability, competency, suitability of tradesmen, businesses and suppliers listed on or linking to MGF and/or the Mummy’s Gin Find Recommended Business Directory. Your listing is for 12 months and will automatically expire unless it is renewed. We will send reminders closer to the time. Your package includes a listing on the MGF Recommended Business Directory on our website (https://www.mummysginfund.co.uk/recommends/). Please check your listing as soon as possible and let us know if any changes need to be made. You also have the right to post in our three Facebook groups: Mummy’s Gin Fund, MGF Buy & Sell and Mother’s Little Helper. You can do this up to once per week as a VIP listing, and twelve times per year as a Standard listing. Please do not advertise more often than that. When you post, you must include a link to your MGF listing. The link is included in the email we sent you when your listing went live. If you lose it, you will find it again by searching for yourself on the website. 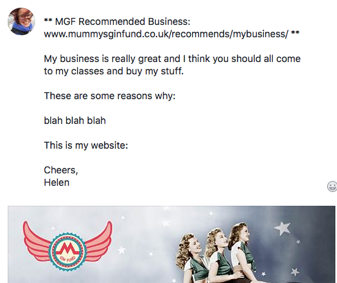 Your Facebook group post should start with ** MGF Recommended Business: (your link) ** and you are then free to post an advert. If you do not use ** MGF Recommended Business: (your link) ** your Facebook post may not be approved. If we do not approve your post we will inform you as soon as possible and advise of any changes required. You are also permitted – and encouraged – to post your link and an advert / message any time a recommendation is asked for in any group. Non-Directory businesses are not allowed to do this. We police this to the best of our ability but an occasional rogue comment may get through. Please report any that you spot. By listing on the MGF Recommends Directory you accept and agree that your business will be reviewed by your customers. All reviewers must be logged in before leaving a review. All ratings are moderated by us before being published onto the site. We reserve the right to make changes to Mummy’s Gin Fund, our social media, the website, directory and these Terms and Conditions. We will always give prior notice, where possible.